I'm back on a picnic table, this time in the Sterling City Campground near the city pool, which is free to cyclists. Mike has ridden into town to the Laundromat. We had great riding conditions today: temperatures in the 70s, overcast skies, gentle hills, and a light tailwind. We have been wondering if we could increase our mileage, but doing so would put us completely out of step with the far-spaced accommodations. On a day like today though, we could have put in more miles but we wouldn't be spending time relaxing and enjoying this park. We have been experiencing the friendly reputation of Kansans. Several times we have stopped briefly by the side of the road, and had people pull over to ask if we needed any assistance, water, or directions. 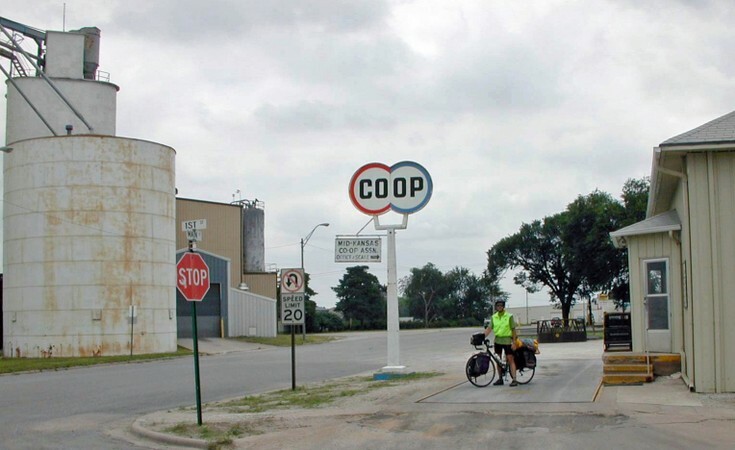 Most of the locals know where both the eastbound and westbound TransAm bicyclists are going next and are eager to give directions, and everyone waves. We talked to a woman today who relocated to Sterling from southern California. She detailed the culture shock and benefits of moving to this small Kansas town (inexpensive real estate, low crime rate, community spirit). While we were talking, several cars drove past with drivers waving. "Do you know them?" we asked. "Never seen them before in my life", she said, "but you must wave,... wave,... don't forget to wave." She told us that she had been in a restaurant in town where a bunch of the local farmers were hanging out as usual, when another farmer came in wearing a wrist brace for carpal tunnel syndrome. Finally someone had to comment. "Pete, what happened to your arm?" Pete paused for a moment, and said, "Doc says I've been wavin' too much." Sweaty, and waving,... always waving,... in Sterling. For the last few weeks, we have noticed every small town has been gearing up for the Fourth of July. Sterling makes it into a five day celebration, including a bluegrass festival, a rodeo, and the popular Running of the Turtles. We were invited to stay for it, and though it would be fun to stick around for the celebrations, we have to move on down the road. 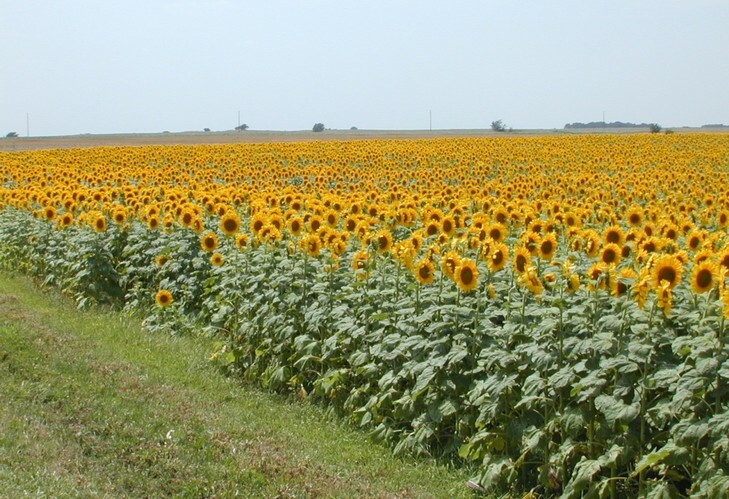 Today we rode out of the Flint Hills and back through agricultural land, including fields of corn, sunflowers, soy beans, and wheat. Connecting the laptop to a phone line has presented some challenges, so I cannot always update the journal daily. I have used phones in restaurants and truck stops and even held up other customers while I used the credit card modem line at convenience stores. 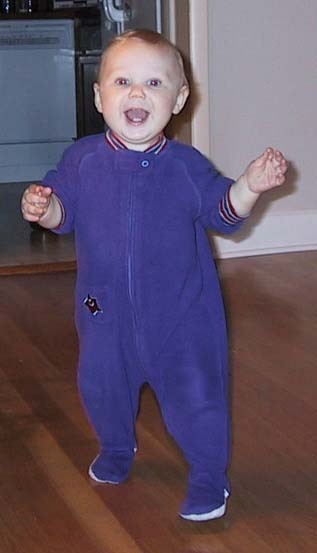 Packing the computer has been worth it though, especially when we can also receive digital grandbaby pictures, like this recent picture of Braden, now walking/running at age 10 months. We are glad the Libretto is working out as well as it has.